Here are my top ten tips for linocutting. 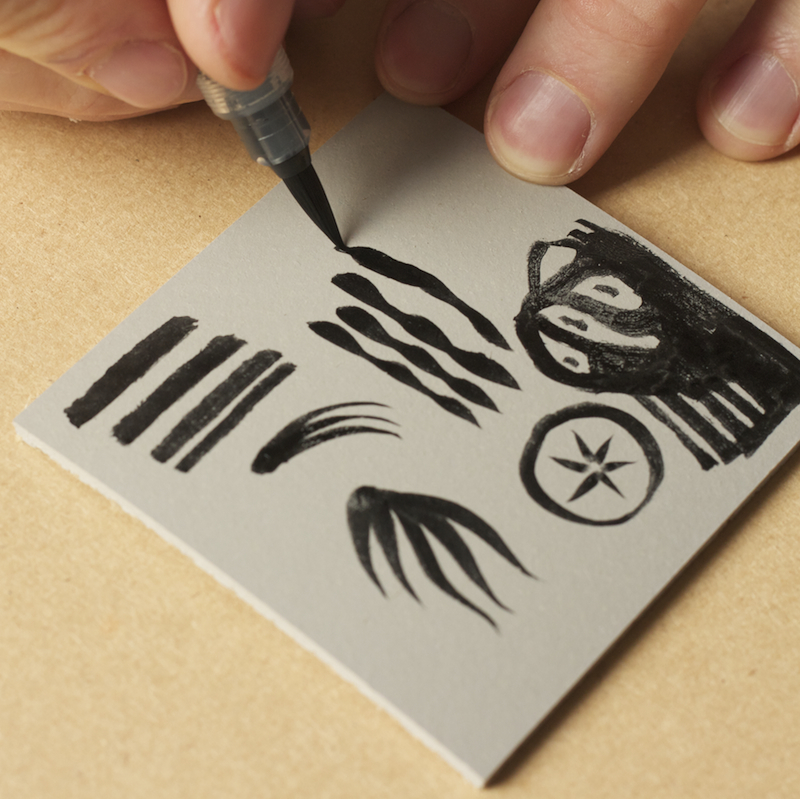 Before you go straight into carving a design make a test print on a small piece of lino. Practise making a range of marks. Don’t worry about making a recognisable image, just play around and make as many different shaped cuts as you can – lines, dots, dashes, circles, marks which get thicker and thinner. If you can, get a few different tools: V-gouges, U-gouges, large and small. Use all the tools you have, each will make a different kind of mark. For example, a V-gouge will make a very fine line if you use just the tip. If you carve deeper it will make a wider line. You control the tool by the angle you hold it at. Holding it at a steeper angle makes the cutting edge go deeper. Holding it at a shallow angle brings the cutting edge up. 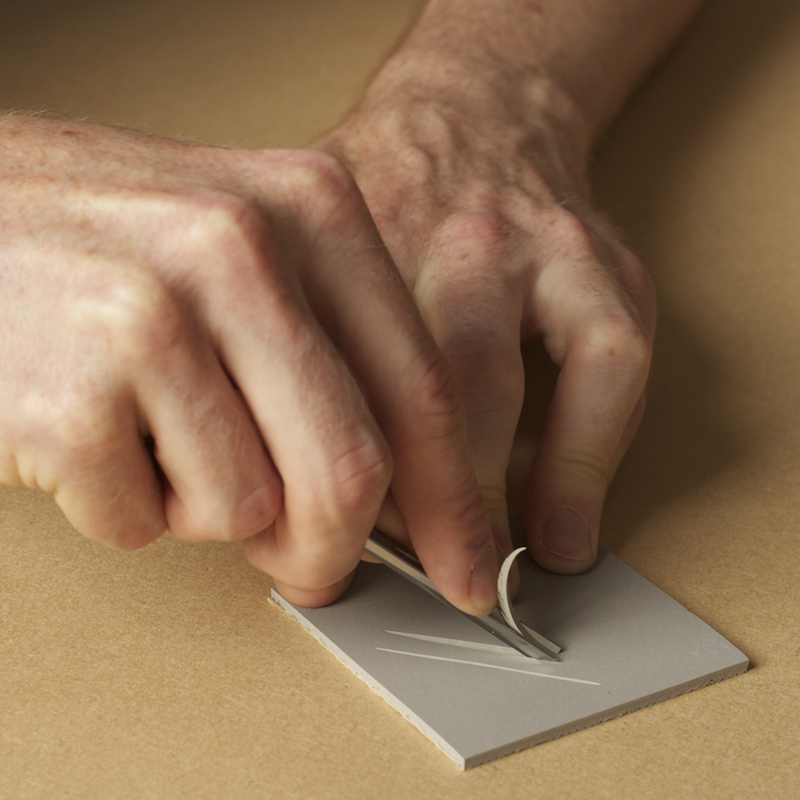 With practice you should be able to carve a continuous line by finding the right angle. If you keep slipping, lift the handle slightly to make a steeper angle. Drawing your image out in black ink will help you visualise the design and ensure you cut away the correct parts. You may even want to shade in all the areas that will be black on your print completely. Sharp tools give you more control and enable you to cut clean lines with less effort. A lot of cheaper tools are not sharp when you buy them, which doesn’t help matters. Tools should be sharpened little and often. Use an oilstone or Japanese wetstone. There is a very long and intense video on sharpening tools on youtube here. 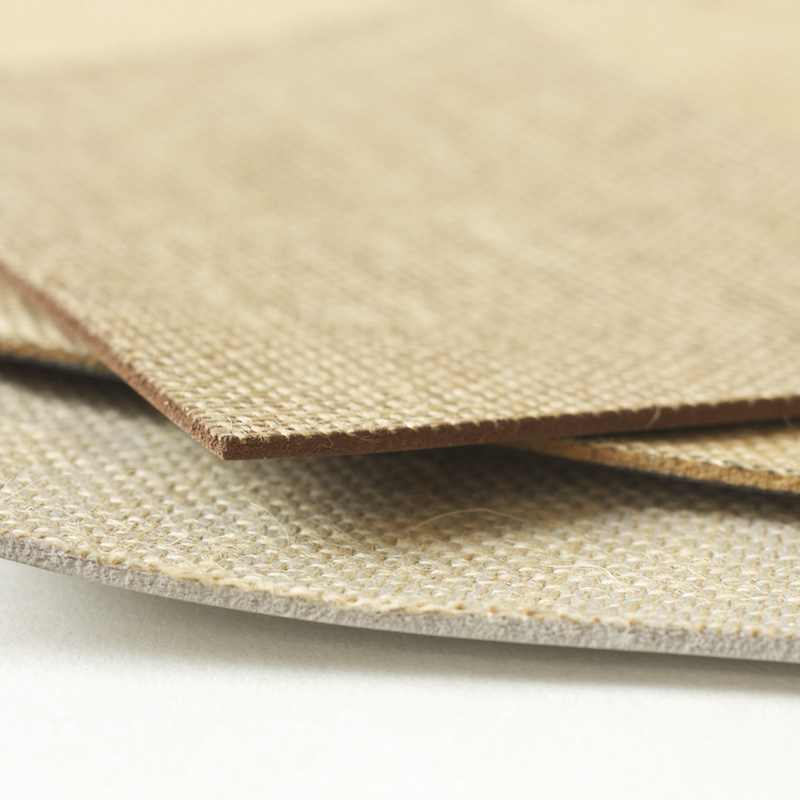 Linoleum is made from natural materials: linseed oil, cork and resin. Over time it dries out and becomes hard and brittle. Fresh linoleum smells of linseed oil and is flexible. Make sure you buy fresh! I recommend Intaglio Printmaker. If you follow a few basic principles you should be able to prevent ever cutting yourself. The first and most important of these is to cut away from your hands. 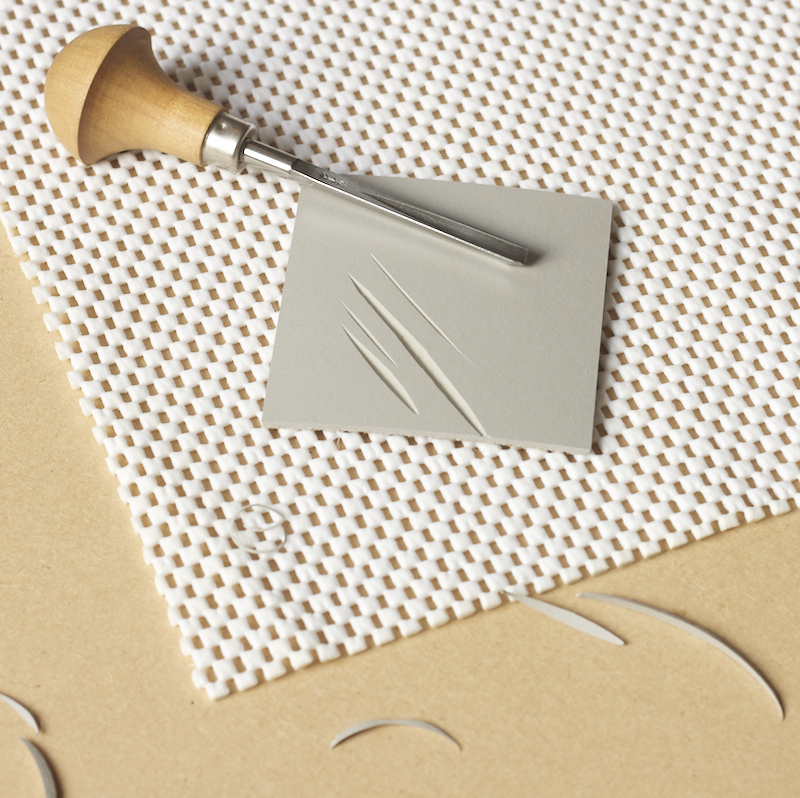 Placing your lino on a non-slip surface like rubber of felt means you don’t have to hold onto it with your non-cutting hand. This will save a lot of energy and arm-ache. You can buy cheap non-slip matting from pound shops. As you carve in different directions, rotate the lino block rather than twisting your body around. This will save you more energy (just imagine what you will do with all that saved energy!) and avoid you cutting inwards towards your vital organs. Carving lino takes concentration. Rest your brain and your eyes frequently by going outside to look at the clouds or doing some squat-thrusts (see, that extra energy came in useful). A very well layed out blog showing the technique well, however, when I was taught this medium 60 odd years ago I was advised to warm the lino prior to cutting in order to ease the blades through the lino thus giving a finer edge to the design. I trust you will agree! Hi Howard. Thanks for your comment. Actually, I never feel the need to warm my lino. I think this is because the lino they make now is softer to cut, but it’s also because I use fresh lino and sharp tools! I find warming up the lino makes it a bit crumbly which can be dangerous when you are doing fine detail work. I still have the old stuff stuck to thick ply blocks. I did buy some modern, supposedly easy cut stuff lately. It’s a bit like a sheet of rubber! Glad you read it in time. Never give up! Hi, I haven’t done any lino for YEARS and for my Final Major Project I am doing a Lino print. Testing my skills, however I can not see ANYWHERE the best way to clean the lino and the ways NOT to clean? As I feel I may have ruined my Lino or have Rubbish ink. Hi Lauren. Oil-based inks can be cleaned up with vegetable oil. To remove the oily residue at the end you can use a drop of white spirit, or preferably Zest-It, which is safer. Use a soft cotton rag (an old T-shirt is ideal) and wipe gently to avoid damaging the block. To clean water-based inks use soap and water, but avoid getting the back of the lino wet as it will go curly. If you do happen to get the back of the lino wet (I’m pretty clumsy) you can stop it going curly by sandwiching it between 2 bits of something like glass as it dries ( I use 2 glass place mats/chopping boards which, incidentally, are what i use as my smooth surface for rolling out ink) and they dry nice and flat! using those glass boards to roll out ink is brilliant!!! Great info – very clear and inspiring. Thanks for sharing! Super blog! I’m wondering if any of you know, can you sharpen those Speedball carving tools that you buy in the craft stores? The ones that have the interchangeable blades that store in the handle? Thanks. Hi Angie. You probably could, but I don’t think it’s worth it as they aren’t very good quality. If you want to stick to the Speedball ones I would just buy replacement blades. Sorry to be so blunt (ho ho). Any tips for printing? Like paper stock or method of printing? Any tips on preventing linoleum from drying out? Hi Andi. I would keep it in a drawer and maybe wrap it in plastic. And keep it in a cool place. Just like food I guess! It’s the moisture in the linseed oil evaporating which makes it dry out so it might work to rub some fresh oil into it too. Hope that helps! What paper do you recommend? I’ve been using Japanese Simili paper, 80g/m2. Sometimes the strip of plain white paper between the printing and the mount goes “crinkly”. How can I prevent this? Should I use a different paper? Thanking you in advance…. I have been occasionally trying out lino cutting for some time, off and on, and I find I am clumsy and make hard work of the actual carving. I find shallow finer lines easier as when I did deeper I mess up. I just want to be better at it. Won’t give up. Very nice website. just watched how you did the submarine man, such great work! Now, what tools do you use for painting the sketch on the lino, the black and white ink and the brush. Could you please give me a brand name or something so I know what to look for? Looks extremely useful! That would be very kind. Thanks in advance. I’m very new to lino cutting, and wondered if you had any tips for cutting a gravel effect for small stone beds in a landscape? I can’t seem to find a tool to cut dots. For smaller dots try using a V blade, placing the tip slightly into the linoleum and then spin either your tool or the linoleum. It just takes practice. Thanks for the tips, really really useful! Question: do you think I could use my little dremel hand drill for cutting dots? Excellent tips. I’m currently attending a print class, and the tutor is useless – no basic information supplied re practicing using the tools. So your advice is much appreciated. Really good tips, many thanks for sharing. Been following your work now for a while since wanting to experiment with lino cutting. Keep up the good work! Thanks! It was a really big help since in school we are studying in art, Lino Cutting so it help nicely and i understood how to do lino cutting which then helped me with my homework. Once again thanks! I have been cutting lino for a cpl of years…starting with the commercial VCT that, incidentally, I will be gluing to my kitchen floor soon. So I have been finding the commercial carving lino to be a little bit mushy, as it wants to pile up in front of my cut like a wave. Looking at posted work by others I have begun to think that a lot of artists use Dremel type tools. Comments? I have a good set of two sizes of chisels, and sometimes use the little kit set. I have bought a dreamed and had a go . It works fine but I still have to find some finer carving bits. The one I have is ok but a bit big for detailed work. I just bought my tools and lino as I misplaced years ago. About to try out some cutting again. I did lino cutting 25 years ago and jabbed the flesh between my thumb and forefinger…..ouch, never deterred! I used to rub the back of the paper with a spoon as I have no press. Any better ideas? I love making lino prints but,, because I use several layers of ink and do not have a press, the end result is speckled with all colours showing through.. I do not get blocks of solid colour. The prints have a “painterly” effect which is intentional. I like this but feel it could be frowned upon by “purists”..Do other printers use this technique?? Thanks for this. I was advised to buy a bench hook for safety, but made my own instead from some scraps of wood. It helps enormously! Please add me to your mailing list if you have one. Thanks! I would like to use lino cut shapes for printing on to ceramic biscuit ware. Is there such a thing as a ‘print medium’ that I can mix with ceramic oxide washes that will burn off in a firing ? I’ve been printing for 2 years; lino cut and gelli printing. I want to concentrate on lino and grow my skills. Your website has been a great teacher. Reflecting on my work, I recognize that I don’t spend enough time on the elements of design because I love the carving process ( plus I received Pfeil tools for Christmas). I would love any guidance or resources that you could offer. Just received a copy of your book and it is just what I needed! Thank you! I made my very first linocut 2 days ago. I think I’ve found a new passion. Thank you for these helpful tips. Any tips for getting a clean edge. Some of my last prints didnt have a perfect edge and i’m wondering if it could be i used old lino? Also if you have any tips for perfect printing to get it crisp? I think ive been over inking a tad (i think due to my roller which ive now changed, but it would be great to get advice.